Over the past few months, our long range department has been noticing the increasing potential that El Niño conditions could develop by later this summer / early autumn and carry us through winter 2014 – 2015. The big question is, what types of impacts can we expect across the nation over the next several months based on this projection? Let's investigate the possibilities. First and foremost, aside from the equatorial Pacific, most impacts due to El Niño are typically seen across the North Atlantic Basin and subsequently affect development of tropical cyclones during the hurricane season. Historically speaking, El Niño is correlated to below normal sea surface temperatures and higher than normal levels of wind shear across the Atlantic…both of which are associated with suppressed tropical activity across the basin. The following image is a seasonal forecast based on the ECMWF Model, which depicts precipitation anomalies across the Atlantic Ocean. 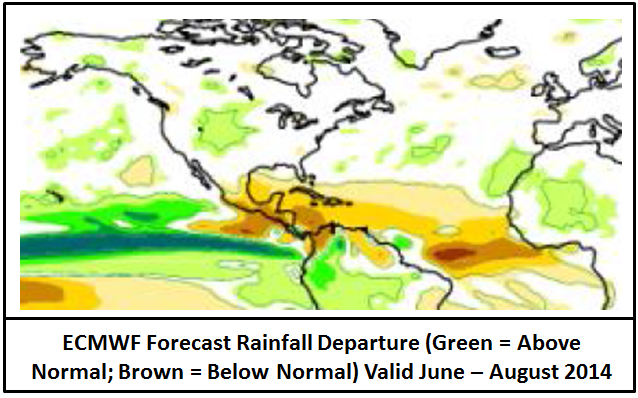 The various levels of brown shading across the region indicate drier than normal conditions, likely as a result of the model “seeing” fewer than normal tropical cyclones developing. This would be a welcomed relief for coastal residents, as the past few years (except 2013) have all featured an elevated number of landfalling tropical storms and hurricanes. Note that the exact opposite is true across the Equatorial Pacific, where enhanced activity will likely lead to a busier than normal tropical season in that part of the world. In terms of the sensible weather impacts of El Niño on summer temperature and precipitation patterns across the continental US, the historical data is less definitive. With that being said, there are some bits and pieces of information we can glean from the possible development of El Niño. The image below shows temperature and precipitation correlations based strictly on historical data collected during summertime El Nino events. Note the strongest signals for temperatures exist across the Plains, Midwest, and New England – where cooler than normal conditions would typically be expected. 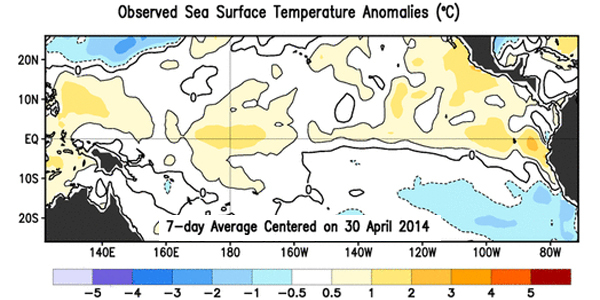 Conversely, warmer than average temperatures are often seen across the Pacific Northwest. In terms of rainfall, the only signal of legitimate meaning is across the Rockies, where enhanced precipitation (red shadings) typically occurs. Everywhere else the correlations are mostly weak (less than +/- 0.2) and therefore not very significant. When it comes to the upcoming winter, the overall pattern associated with El Niño (should it persist through then) becomes better defined. 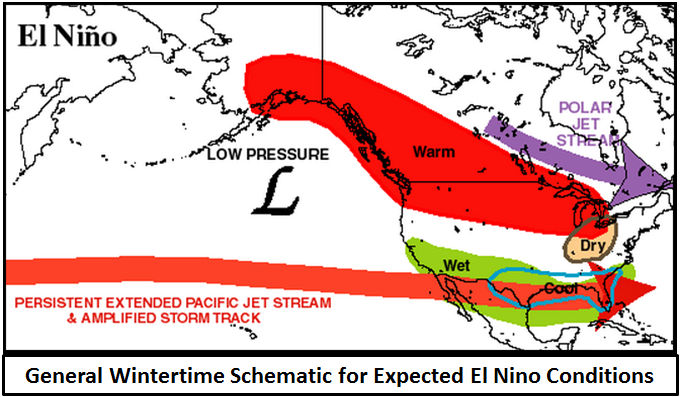 Most often, wintertime El Niño’s feature an enhanced subtropical jet stream – which is associated with above normal rainfall and cooler than normal temperatures across the Southern Plains and Southeast. Further north, the most common outcome favors above average readings and drier conditions overall. Depending on the exact strength of El Niño, the snowfall outlook could vary considerably. During a weak or moderate El Niño event, one would expect above normal snowfall across the Mid-Atlantic and Northeast. However, the stronger the El Niño becomes, the more likely it is for warmer air to flood the Northeast Corridor and result in mostly rain as opposed to snow. This will be monitored closely as we head through the summer and fall, as it will undoubtedly have important implications for next winter. Luckily, this is still several months away – giving us plenty of time to analyze the possible implications. Image courtesy of the Climate Prediction Center/NOAA.